I like Pinterest, but I'm becoming frustrated with how I can pin and pin all I want, but that doesn't mean I'm actually going to do it. So, I'm challenging myself a bit. 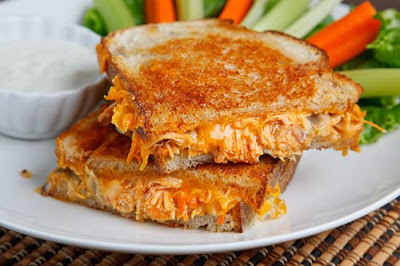 This is Buffalo Chicken Grilled Cheese AND IT IS SO GOOD! I followed the recipe pretty close, but the is what I did. You can get the full recipe from the source that I've linked it to if you want to follow it religiously. 1. I put the chicken in the crock pot when I came home for lunch and poured the whole bottle of buffalo sauce in. I set the heat on high and let it cook until 4:30 p.m. before turning it down to warm. 2. Shred the chicken and then add the diced celery and carrots. 4. Butter two slices of bread on one side each and add a scoop of the chicken mix to one slice. Top with about 1/4 cup of cheese. 5. Assemble the rest of the sandwich and grill until golden brown. 2-3 minutes per side.